Bob Garfield's 'Chaos Scenario' According to On the Media host Bob Garfield, we are in the midst of a new world order. In his book, The Chaos Scenario, he digs into the digital revolution that he says will devastate mass media, and make you the next mogul. According to On the Media host Bob Garfield, we are in the midst of a new world order. In his book, The Chaos Scenario, he digs into the digital revolution that he says will devastate mass media, and make you the next mogul. By now, everybody knows that the digital revolution brings wonders to your laptop and to your cell phone with much, much more to come. But Bob Garfield argues that we sometimes overlook the portent of that word revolution, that metaphorical guillotines accompany sweeping change. The media giants we've all become accustomed to - newspapers, magazines, radio and TV are already losing their heads as audiences and advertisers drift away. And again, what follows will be very, very different. So if work in media or marketing, what are you doing to adjust? What will your business be like in five years? Our phone number is 800-989-8255. Email us: talk@npr.org. And you can join the conversation on our Web site. That's at npr.org. Click on TALK OF THE NATION. Later in the program, Bill T. Jones us to remember the great Merce Cunningham. But first, Bob Garfield joins us from his home in Virginia. He's editor-at-large for Advertising Age and co-host of NPR's ON THE MEDIA. His new book is titled "The Chaos Scenario." Bob, nice to have you on TALK OF THE NATION. BOB GARFIELD: Hi, Neal. Hi, nation. CONAN: There are plenty of smart people, Bob, who think this is a little overstated, that CBS, the New York Times and National Public Radio and Madison Avenue are all going to find ways to adapt and thrive. GARFIELD: Well, overstatement is the way to get attention, isn't it? GARFIELD: But, in fact, it is not overstated. We are not only facing an utter collapse of all of the media infrastructure we've so come to love and depend on for going on 350 years, we're in the middle of it. It is - has long since begun. The newspaper industry in the midst of a precipitous decline. Television is in the midst of a precipitous decline. The record industry's already almost gone. And, you know, magazines are having the worst year in modern history, after the - a year before that was its previous worst year in modern history, and on and on and on. Because structurally, the media can no longer survive. CONAN: And you also point out - which I've not seen others do quite as much - the relationship between mass marketing and mass media. And, in fact, you say there's going to be a tipping point at which mass marketing is just going to leave mass media in droves. GARFIELD: That's right. And, in fact, they - both of them end together. They have been a perfect yin and yang for 350 years, a perfect symbiotic relationship, depending equally on one another and giving us - you know, in the intervening time - newspapers and magazines and television, you know, the "Green Acres" and the "CBS Evening News" and the Super Bowl and the Kennedy assassination. And nobody wants this to go away. The media culture is very important to us. It's very important to our democracy. We depend on it. We believe it's our birthright, and yet, you know, it's not a - this yin and yang that has been with us all our lives and for many generations before us is not a Newtonian law of physics. It's not in the 10 Commandments. There is nothing there - I've pored over them - that says thou shalt have new episodes of "Lost" or a profitable New York Times. And it's a disaster in progress. CONAN: It's interesting. I was talking to somebody the other day, and he said, oh, did you read the article in the Times about - I said, oh, the front page piece about the reality shows, the constants. He says, oh, I read it online. And then he looked at me, he says, I guess I'm part of the problem. GARFIELD: Well, he is part of the problem. Ironically, the audience of the New York Times and just about every other major newspaper has dramatically expanded for the last - over the last 10 years because online, you can - you know, you can be read anywhere and - here's the key - for free. So because - you know, free is a really attractive price, and you can't argue with the convenience. So people are reading the New York Times more than they ever have in its history. The problem is the advertisers will not pay for an online ad what they've paid for traditional media ads for years and years and years. And that's because the Internet world - while giving us so many wonderful things the digital revolution has provided for us - it has created an almost bottomless reservoir of content, and therefore almost a bottomless reservoir of advertising inventory, which depresses the price that any publisher can fetch for its advertising. So the problem with the New York Times and it - ABC TV and everywhere else in the old media world, is they cannot generate enough revenue from advertising to pay for the content we have all come to love and depend. And it's not going to get better. It's only going to get worse. GARFIELD: Supply and demand. It's a basic law of economics. CONAN: Yet you point out, part of the reason we can watch our TV programs on Hulu.com just as easily as we can on ABC or NBC or CBS, but somebody needs to produce those programs to be on Hulu.com. CONAN: Bob, I have - excuse me, I have to interrupt. This just in: The Senate - a majority of U.S. senators has voted to confirm Supreme Court nominee Sonia Sotomayor. The senators are still voting, but she has already garnered enough votes for confirmation. She will be the next associate justice of the United States Supreme Court. There will be more on that later today on ALL THINGS CONSIDERED and NPR News. So stay tuned for that. GARFIELD: Not at all. I was hoping to make news in this interview, and I see that I have. CONAN: It's all up to you, Bob. Our guest, of course, is Bob Garfield. 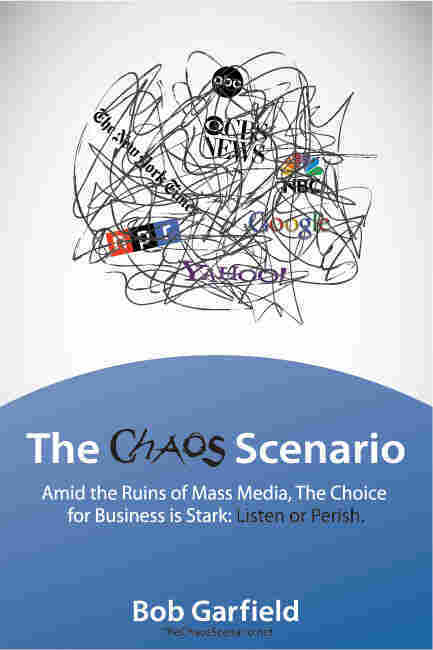 His new book is "The Chaos Scenario: Amid the Ruins of Mass Media, the Choice of Business is Stark; Listen or Perish." And we're asking listeners today: If you work in media or marketing, what are you doing to adapt to this vastly changed landscape that we're talking about? 800-989-8255. Email us: talk@npr.org. And let's go to Julie. Julie's with us from St. Joseph in Michigan. JULIE: Well, I'm calling in because I heard what you were talking about. And one of the things I've done as a media and PR person - I have a company called Think Tank Media - and we really, really focus on hyper-local marketing. Because it used to be everyone was so worried about how to get the word out to everyone. But it's almost like you've got to go back to guerilla-style, one person at a time. We - I work with a lot of 501(c)(3)'s on their fundraisers, and we create events and stories that involve the community so that the newspapers will cover it, and ultimately they'll sell more newspapers because of what we're doing. So it's almost like, you know, you're kind of paying it forward by creating great events and great news stories so that local radio can get their listeners and local media can get people to buy their papers. And then when you do that, I feel that you're kind of help - all helping each other out. CONAN: Bob Garfield, that's a symbiosis that's worked very well in the past. GARFIELD: Yeah. And, you know, and I think Julie's onto something, because while mass media are doomed and mass marketing is doomed, that doesn't mean media and marketing are doomed. They're just going to scale dramatically, dramatically downward. CONAN: And every once in a while, they get a national plug. GARFIELD: Oh, how could that happen? CONAN: Oh, I don't know, a marketing person on our air. GARFIELD: Welcome to the world of micro media and micro marketing, which is increasingly going to be our future. Julie has described it very eloquently. CONAN: Julie, thanks for the call, and thanks for the wonderful demonstration of absolutely flawless plug-ola. JULIE: I'm going to try to get a tape of this. You better believe that. CONAN: All right, thanks, Julie. JULIE: Have a great day. CONAN: Bye-bye. Let's see if we can go next to Renee. Renee with us from San Francisco. RENEE (Caller): Hi there. I work in event management and marketing, and pretty much every job listing I've seen in the past two months has required social media expertise across the board, like Facebook, Twitter, LinkedIn, anything like that. You have to have that knowledge now pretty much to be able to get any kind of marketing job, at least in the bigger cities like San Francisco and I think New York. I actually had an impromptu job interview based on social networking with someone else in a different city while I was visiting there for a vacation. It just kind of fell into my life because we were social-networking with each other. CONAN: Bob, can we get a response, or are you busy tweeting? Mr. GARFIELD: Oh, I am tweeting. I'm tweeting my head off these days because of course to publish my own book we have embraced social media in a way that I'm pretty sure is unprecedented in publishing history. It's not the - it doesn't have the efficiency that mass media has afforded us for the last three-plus centuries, but it does have many other advantages -namely, I mean the most important being, when you get a message from a friend, a trusted friend or associate, even if it has, you know, some sort of commercial message embedded within it, you're apt to trust it far more than you would ever trust, you know, anything dictated to you by Proctor & Gamble channeling its marketing message through Mr. Whipple or something like that. Mr. GARFIELD: And it is - it's very difficult to achieve. You basically have to aggregate an audience, where before you just, you know, bought media time and shouted to everybody. But you know, not only is it a path to the future, it's pretty much the only path to the future, and it's not - it's not easy to accomplish. It's not going to instantly replace the beauty of the yin-yang symbiosis marketers and media have always enjoyed, but you know, got to do something. CONAN: Renee, what's considered expertise in social networking? RENEE: Well, they want to see professional blogs. They want to actually view your Twitter accounts and see what kind of tweets you're sending out. So it's a really slippery slope because having worked in PR, I'm quite aware that there's a difference between what you might tweet or post on Facebook personally and what you might put out there as an official company message. There have actually been some really interesting media campaigns that have been done by companies like Moonfruit and Ben & Jerry's in the last couple months using Twitter, and they are very, very viral when they do stuff like that. Like Moonfruit was giving away several Macbooks if you tweeted Moonfruit in your tweets, and it generated a whole lot of traffic on Twitter, and it was actually really successful because this company has been around for I would say over 10 years. I was marginally aware of them, but it brought a lot of people to their site and generated them tons of publicity and awareness that they wouldn't have done if they had done just normal advertising, which would have cost them a lot more money than the expensive 10 Macbooks. CONAN: Ah, maybe we'll give away Political Junkie T-shirts if you tweet Political Junkie. I don't know. RENEE: It may not have the cache as a Macbook, but yes, you could definitely do that. Mr. GARFIELD: Oh, it's much better. CONAN: It's much better. It's much better. Renee, thank you very much for the call, appreciate it. CONAN: Our guest is Bob Garfield. His new book is "The Chaos Scenario: Amid the Ruins of Mass Media, the Choice for Business is Stark: Listen or Perish." We'll have more in just a moment. If you'd like to join us, if you work in media or marketing, well, what are you doing to adapt? 800-989-8255. Email us, talk@npr.org. I'm Neal Conan. It's the TALK OF THE NATION from NPR News. CONAN: This is TALK OF THE NATION. I'm Neal Conan in Washington. Bob Garfield writes in the introduction to his new book: Maybe you've been too busy fiddling with your smart phone to notice, but the mass media and mass marketing structures that have more or less defined your connection with the world for more than a century are in flames. Traditional media are in a state of dire retrenchment as a prelude to complete collapse. I'm not talking about the death of media and marketing, I'm talking about a dramatic rebirth. When the TV age finally succumbs to the digital age, we will be living in a different world and mainly a much better one. Bob Garfield's book is, as we mentioned, "The Chaos Scenario." You can read an excerpt at npr.org. Click on TALK OF THE NATION. He's also co-host of NPR's ON THE MEDIA and writes for Advertising Age. If you work in media or marketing, what are you doing to adjust? 800-989-8255. Email is talk@npr.org, and you can join the conversation on our Web site. That's at npr.org. Click on TALK OF THE NATION. And Bob, we're talking - media and marketing companies are also in the process of adjusting, knowing that mass marketing is not necessarily going to working for them. Tell about something called the Mindstorm Experiment. Mr. GARFIELD: Yeah, this is fantastic. You know, what I did, Neal, in doing this book is I traveled around the world looking for examples of the new forces that are affecting media and marketing and also the relationship between all institutions and the group formerly known as the audience or the electorate or the congregation and what have you, because in the digital age, those - all of those relationships have been fundamentally changed. Mr. GARFIELD: Cache, yeah. So of course they decided to make a robot toy that you can use LEGO materials with and then program to fetch and crawl off of tables, and I don't know what all, and they introduced it to their 10 to 14-year-old-boy market and discovered that it didn't really do that well because it was a little too complicated, a little too expensive, a little un-LEGO-y. But what they discovered by accident is that it did appeal a great deal to people in their 20s and 30s, nerds, engineers, robotic hobbyists and so forth, and a genuine subculture was forming around this brand. So they misjudged the market, but the market was there. Well, in a couple years Mindstorm's got a little long of tooth and LEGO needed to do a redesign. So what they did was the very heart of what I call the art and science of listenomics. They decided not to decide in-house what this line should look like. They went out to this fan base, which they located on chat rooms and Web sites around the world, and they invited them to come to Billund at their own expense and to participate in the redesign of the Mindstorm's line of products. And they filled up the roster on the first day, and the next thing you know, people were flying to Denmark, and they spent, I don't know what it was, I think six weeks there, again at their own expense, went in every day, got into the inner sanctum at LEGO, where no civilians hitherto had ever ventured and redesigned this line and then worked on it for another 14 months when they got home at their computers. And when the new line was launched after about two years, it was almost entirely the work of these volunteers who were nothing more than LEGO fans. CONAN: They're talking it up. Mr. GARFIELD: They talked it up relentlessly. They were evangelists, the most impassioned evangelists. And - now, just expand that for every business and every institution in the world. If you can now instead of just dictating to the hoi polloi, you can tap the immense IQ resources, the immense labor resources, the immense idea resources, the immense passion resources, and maybe most of all the most immense evangelism resources of the group you used to just, you know, try to get the credit card number from, and you realized that businesses and the Vatican and the U.S. government and other institution has the ability to mine the largest pool of value ever assembled in human history. That's why the digital world ultimately, after a huge shake-out that will probably cost both of us our jobs, will be, you know, just milk and honey for our children and our children's children. CONAN: And this note exactly on that point from Nicky in Nashville. I was a food writer, then a reporter, now a food blogger making about 80 percent less than I was 15 years ago. I fill in editing cookbooks. Tomorrow, though, I have an interview at radiography school. Yup, I'm done and headed for the exit. Let's see if we can get another caller on the line. This is Mike, Mike calling us from Holland in Michigan. MIKE (Caller): Hi, Neal, love the show. MIKE: I'm a search engine optimization specialist. CONAN: Search engine optimization specialist. So in other words, if I make little plastic bricks called MEGOs, I go to you and you make sure that when somebody types up plastic bricks, my product name pops right up in that top 10. CONAN: The services like the ones you provide. MIKE: Just even new services, you know. As far as - speak to the LEGO situation earlier, what if there was a specialist that came in to organize, you know, volunteers? I feel like more people would start to bring money if there were more opportunities like that to optimize your marketing. CONAN: Well, Bob Garfield, I don't think it's any surprise that this is all capitalism. Mr. GARFIELD: No. Obviously this is an economic issue, and we live in an, you know, I think it's about 98 percent capitalist world, and sure it is, and there will be many economies forming around the various niches of search engine optimization and former audience coalescing and, you know, all of the various skills that help you succeed in social media. CONAN: Yeah, but interestingly, ask these people: and what's the business plan? You're pouring all this money into this Web site. How are you going to make money from it? And they look at you like you're wacko. Mr. GARFIELD: Yeah, that's the deer-in-the-headlights look because they absolutely have no idea. They have a vague sense that they're supposed to be doing something but they know not quite what. And you know, there's no switch you can throw to make, to transform from the analog world to the digital one. But I guess it's better to get started so at least you get accustomed to the idea of being, of dealing with stakeholders and not just credit card numbers. CONAN: Mike, thanks very much for the call. Here's an email we have from Ben in San Francisco. Newspapers should take the fight to online advertising. Ad-blocking software should be widely reported on the front page of every traditional print media every day. Watch what happens when the online advertisers see very high adoption rates of software like Adblock Plus. Is he Horatio at the bridge? Mr. GARFIELD: Well, you don't need ad-blocking software. It's absolutely not necessary because nobody is paying attention to the advertising to begin with. and this is a very key point, Neal, and I'll try to make it quickly. But you know, people in Madison Avenue have this - are living in this fantasy world where they think they're beloved. They think they're cherished, you know, because Tony the Tiger gets applauded when he goes down Madison Avenue once a year in the Advertising Week Parade. You know, they think we love them. We don't love them. We have always grudgingly accepted advertising because it's been the quid pro quo for getting free and subsidized media: free network TV, cheap newspapers, cheap magazines. We understood that, you know, the compact was we have to put up with advertising. But now we can avoid it. We have DVRs that we skip past the TV commercials. Nobody clicks on a banner ad ever. The click-through rate is two percent, two percent, and most of that's attributable to mouse error and click fraud. Mr. GARFIELD: And you know, in a world where you fetch less and less for your advertising, and publishers do, and broadcasters, and when there's, you know, a vast percentage of ad avoidance, nobody is going to be able to make the nut. So yeah, ad-blocking software is fine, but you know, it's gilding the lily. CONAN: Here's David in I'm not sure where, Oregon. Tigard, Oregon. Excuse me, I hope I'm pronouncing that right. Why does the large media give away their content online for free? I'd be willing to pay $10 a month to have online access to the content of, say, the New York Times, Washington Post, Wall Street Journal and Newsweek. Why does the media not offer this kind of bundled service? Mr. GARFIELD: Because they're stupid. I mean - let me put it more precisely. They were stupid about 10 or 12 years ago when these decisions were being made. They believed that online advertising was going to sustain them in the way that advertising sustained traditional media for three and a half centuries. And they knew their audiences were going up so they made a play to have the largest audiences possible. The more eyeballs, the more advertising revenue. That was the idea. What nobody anticipated was the simple law of supply and demand, which said that the price of online advertising would be depressed. And they have big audiences now, but they get so little for the ads attached to them. In fact, they can't even sell the ads attached to that free content that - they just don't have enough coming in. So now, they're trying belatedly. The New York Times and Fox are talking about charging for online usage. But, you know, that is - that toothpaste is going to be hard to get back into the tube. We all believe that free content is now somehow owed to us. Free, I said it before, it's a very attractive price and nobody wants to go - very few people will want to go from free to $10 a month. CONAN: But they did figure this out for music online. The iTunes, 99 cents. That seems like - it's not free, but people make money from that. Mr. GARFIELD: Yeah, there is an argument to be made and it's not a bad one that, you know, if you charge a little bit, people will pay it because, you know, what's the point of shoplifting from the dollar store, right? However, I think you should know that, yes, iTunes makes a billion some dollars a year selling songs for a buck a piece, but there's still 97 percent piracy rate. In China, it's 99 percent. So, you know, a few people make a few bucks, but the overall economy is, as my editor and pal Chris Anderson writes, increasingly going to be a free one because once people get accustomed to free, they just don't want to pony up. CONAN: Bob Garfield's book is "The Chaos Scenario." You're listening to TALK OF THE NATION from NPR News. And let's go to Amy(ph). Amy with us from San Antonio. AMY (Caller): Yes. Hi, Neal. Thanks for taking my call. CONAN: Thanks for being patient. AMY: Oh, thanks. I am the director of marketing here for a local children's theater, a family theater. And we have found that, obviously, as you were saying, the evangelizing theory that consumers are really in control. And they're at a point now where they really want to be the ones telling their friends and saying, hey, this is a great thing I found. You know, this is a great deal. And on Facebook, we tripled our users in a matter of 24 hours when we sent an eBlast out to our consumers. And before we knew it, we had grown to 400 fans. They were posting pictures, they were posting reviews, they were promoting us on their fan - or on their page to their friends. We were amazed. I mean, granted, we used newspaper and traditional means like that, like radio and everything, but we have found that Facebook and Twitter has been a huge success for our marketing. And it's amazing how things have changed. I worked in advertising for seven years at ad agencies. And now that I'm, you know, on the end of the client, I guess, I have a lot of other options now that I can use that are, you know, free, especially for a non-profit organization that's great for us. CONAN: Hmm. That seems to be adapting to the way things are going to go, Bob. Mr. GARFIELD: …Chris Anderson's New York Times best-seller. I am here to plug "The Chaos Scenario" by me. It was a horrible oversight on my part and I regret it. CONAN: His book stinks anyway, and yours is brilliant. CONAN: Amy, thanks very much for the call and continued good luck. CONAN: Here's an email. This is from Kathleen(ph) in Berkeley. Is it my imagination or is radio, that archaic medium, doing better in the new economy than TV, magazines and newspapers? Podcasts can certainly compete like radio. They offer portable hands and eye-free communication, information and entertainment. But podcasts don't have live radio's ability to instantly update their content and engage with listeners. Bob, you and I have absolutely no interest in the answer to this question. Mr. GARFIELD: Well, I hate to disabuse the emailer of his fantasies, but the answer to his question is, yes, it's a figment of your imagination. CONAN: Our local stations will. Mr. GARFIELD: …because it - the stations would come to 635 Mass. Avenue Northwest in Washington, D.C. and set the place on fire. Even NPR's business model does not work in a digital world. And NPR stations and NPR - the network - are scrambling to figure out how the public broadcasting system works sensibly in the digital world. And there are no easy answers, partly because all the money comes from the individual stations and most of the programming emanates from Washington. It's a tough nut to crack, and commercial radio has even tougher nuts to crack because the fragmentation of audience and the cost of the distribution are killing them too. Broadcast TV, your local network affiliates, they are sucking wind. Their value on the market has dramatically decreased by more than 50 percent. And their audiences are shrinking and their costs are going up. And it's - they are in the middle of a nightmare. And the shakeout will begin very, very soon. CONAN: And we'll end with this email from Moe(ph) in Springfield, Missouri. Thanks for the detailed demise of my industry. It's interesting listening while I design pages for tomorrow's newspaper. I'm looking to survive until January, then go to school to be a nurse. I never thought I will be changing careers at 29. But, honestly, I can't start a family in an industry that has no future. Bob Garfield, thanks very much for your time today. And we'll be counting down the minutes until you're out of a job. GARFIELD: Neal, nation, thank you all. CONAN: Bob Garfield is co-host of ON THE MEDIA from NPR. His book is "The Chaos Scenario: Amid the Ruins of Mass Media, The Choice for Businesses is Stark: Listen or Perish." See, the thing is, "The Digital Revolution" isn't just some news-magazine cover headline. It's an actual revolution, yielding revolutionary changes, thousands or millions of victims and an entirely new way of life. It's not just that you can talk to your refrigerator or bank online or E-ZPass your way through the toll booth while those other suckers in the right lanes are backed up clear to that horrible rest stop with the price-gouging Sunoco and ammonia-scented Sbarro. Those are just minor conveniences afforded by the very same binary code fueling the real conflagration. Maybe you've been too busy fiddling with your smart phone to notice, but the mass media and mass marketing structures that have more or less defined your connection with the world for more than a century are in flames. As you shall see in the first chapter, "The Death of Everything," the times they are a changin'. Traditional media are in a stage of dire retrenchment as prelude to complete collapse. Newspapers, magazines and especially TV as we currently know them are fundamentally doomed, as they shudder against three concurrent, irresistible forces: 1) audience shrinkage with consequent advertiser defection, 2) obsolete methods and unsustainable costs of distribution and 3) competition from every computer user in the whole wide world. What you call articles and TV shows and songs, and what the media industry calls "content," will never be the same again. This will change your media environment in dramatic ways. It will change the advertising industry in melodramatic ways. Madison Avenue, after all, exists to create ads to subsidize the vast expense along the vast expanse of old media. It has footed the bill for Gilligan's Island, The New Republic, The Family Circus, Rush Limbaugh, TRL, and The Wall Street Journal not for the fun of it, but because marketers depended on those media to reach mass audiences. Indeed, they've paid increasing premiums for the opportunity as audiences have shrunk, because even in a fragmented media world, the largest fragment network TV is the most valuable. Now they realize that they are losing not only mass but critical mass. When that is gone, marketers have no reason to advertise, no remotely similar place to spend that $47 billion a year. Therefore, as culturally improbable as it may sound, the days of Madison Avenue dictating messages to you are all but at an end. Goodbye, Mr. Whipple. Fondle all the Charmin you want, but do it on your own time. Mind you, I'm not talking about the death of marketing and media. I'm talking about a dramatic rebirth in marketing and media, in approximately the way the end of the last Ice Age yielded exponentially more species, and more advanced species, than had ever prospered on earth. When the TV Age finally succumbs to the Digital Age, we will be living a different world. And (mainly) a much better one. But for those entrenched in the status quo, involuntary change can be a difficult concept to accept. Titans of the Old Model have spent the past five years wallowing in various forms of hubris and denial. You'll see some examples in Chapter 2 ("The Post-Advertising Age") but for the moment let me just share the 2007 comments of Sir Martin Sorrell, chairman of the WPP Group, the world's largest advertising agency holding company: "Slowly, the new media will cease to be thought of as new media; they will simply be additional channels of communication. And like all media that were once new media but are now just media, they'll earn a well-deserved place in the media repertoire, perhaps through reverse takeovers but will almost certainly displace none." The italics are mine. The absurdity was Sir Martin's. Does he not see that the internet is not just some newfangled medium like TV displacing radio? No, it is a revolutionary advance, along the lines of fire, agriculture, the wheel, the printing press, gunpowder, electricity, radio, manned flight, antibiotics, atomic energy and, maybe, Listerine breath strips. The digital revolution is already having far-ranging effects on every aspect of our lives, from socialization to communication to information to entertainment to democracy, and these Brave New World effects will only be magnified as the Cowardly Old World collapses before our eyes. Not that this will happen. This is happening. Right now. "The Chaos Scenario" excerpt, copyright 2009 by Bob Garfield, used by permission of the author.